got something about TBG in the post-stream chatter today. So it will be a mix between a plataformer and a PnC? 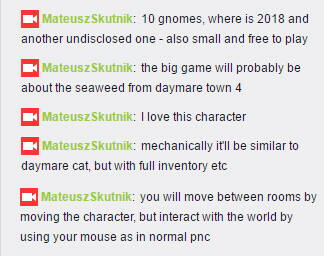 Basically combining the mechanics Mateusz has been using to create games. TBG is surely bringing the whole MateuszVerse together! Can we agree that the small one is the Peter Naverre Game? PNCE. Btw anything in the QandA after the stream?